The remote, uninhabited island of Falconera almost half way between Athens and Crete is the focus of daring exploits in the last months of World War II. If the German munitions fleet succeeds in reinforcing the German army on Crete the Occupation will continue, prolonging the war. The British navy can stop this fleet only if they can locate it, information that only can be provided by a small schooner from the Greek Schooner Raiding Flotilla. The story is fiction but the setting real. 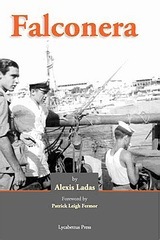 The author, Alexis Ladas, was a 24 year old captain on a Greek Raiding Schooner in 1944. The little known Greek Schooner Raiding Flotilla in World War II; its bases in Alexandria, Egypt and Deremen, Turkey; its only slightly disguised commander; and the feelings of the book's hero in war were very real indeed. The author wrote what he lived. On one level, this book is a gripping romance and a suspense-filled tale of action. It also is a fount of information about the Aegean, sailing in the Aegean, and Greek sailing lore.